The demonstrators gathered at Portland Place, outside BBC Radio theatre, to protest against the Israeli occupation of Palestine. 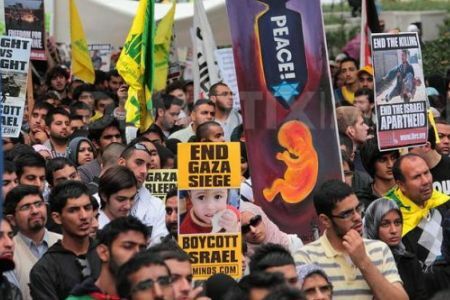 Afterwards, demonstrators marched through central London to Trafalgar Square where they listened to speeches addressing the Palestinian issue. Demonstrators carried Palestinian and Hezbollah flags and various anti-Zionist placards reading “Zionism is racism”, “freedom for Palestine”, “end occupation”, “end the killing”, “end the Israeli Apartheid”, “stop funding genocide”, “right vs. might”, “63 years of occupation must end”, “silence is complicity” and “boycott Israel”. Moreover, the Pro-Palestinian demonstrators chanted: “we are all Hezbollah”, “end the occupation now”, “Zionism terrorism”, “we are all Palestinians”. Al-Quds Day demonstrations are usually held on Saturday or Sunday in Britain because Friday is not the official weekend holiday in Britain. Chairman of the Islamic Human Rights Commission in London, Masoud Shajareh, who organizes Al-Quds Day demonstrations in London, said that Al-Quds Day is the international day of protesting against oppression. Shajareh stated that Al-Quds Day is an appropriate opportunity for all human rights and pro-Palestinian activists to protest against the brutality of the Israeli regime calling for an end to 63 years of occupation which has inflicted irreparable damage upon the Palestinian nation. Furthermore, he said that organizing these demonstrations in Britain during the past decades has raised public awareness with regard to the realities of the Palestinian issue. Shajareh asserted that numerous organizations and institutes have expressed their support for the Al-Quds demonstration this year including anti-war and civil organizations, and anti-Zionist Jews. Stop the War Coalition, the Muslim Council of Britain, the Palestine Solidarity Campaign, anti-Zionist Jews, the Islamic Society of Britain, Friends of Al Aqsa, the Palestinian Return Centre, and Islamic Assembly of Ahl-e Beit supported the Al-Quds Day demonstration in London. Meanwhile, there was a small counter demonstration by the members of the anti-Islam group, English Defence League, who were angry at being disallowed to display their St. Georges cross flags.